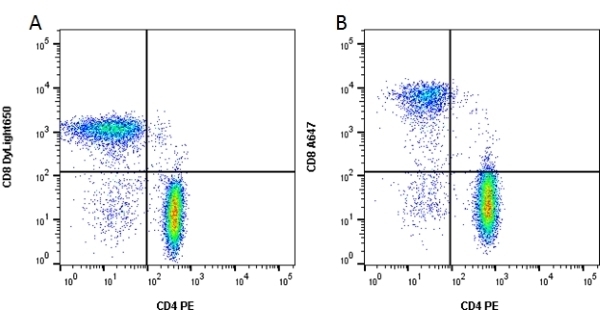 A. Purified CD4 (MCA1267) and CD8 (MCA1226) were labeled with LYNX Rapid RPE Antibody Conjugation Kit (LNK021RPE) and LYNX Rapid Plus DyLight 650 Antibody Conjugation Kit (LNK241D650) and used to stain human peripheral blood. B. Alternatively directly labeled antibodies (MCA1267PE and MCA1226A647) were used. The staining shown are lymphocytes gated on the CD3 positive population. CD4 and CD8 positive T cells can be identified in both plots. Data acquired on the ZE5™ Cell Analyzer.